Years ago, there was an amazing English teacher in my high school that treated us students a bit differently – like people who could think analytically and judge the merits of ideas and experiences. I think I did some of my best academic work for him, and quite often, Mr Wentworth comes to mind when I am contemplating Anakin’s ultimate end (for now) on the Second Death Star. Mr Wentworth questioned how redemption was offered and possible for Anakin at the end of his life since most of his life had been in the service of darkness and evil. It is indeed a tough question. Does it give us the possibility of living a terribly immoral life and stealing a space in Heaven through a few words? If so, then where is the motivation for goodness in this world? I think the answer is much deeper and existential. We are called to be unified to the light side in this world. To do good, to love others more than we love ourselves, and to give all that we have for the welfare of our neighbor. To be virtuous, moral, compassionate, beings carrying the image of the divine. Those things call us to empty ourselves of selfishness and deception, both of which might be seen as virtues in our modern society. When a lone Jedi fights against the Code of the Order, it leads to personal pain with repercussions on all involved. This is seen in the way Anakin’s relationship with Padmé progresses (there has been a fair bit written about the unenviable pathology of that union). It is when the will of the person and the will of goodness align that true joy and eternal happiness are found. I think of the examples of Qui-Gon and Obi-Wan when ruminating about those who have lived the good Jedi life and aligned their wills to that of the Force itself. A few weeks ago, a friend gave me a framed poster that has really got me thinking further about the good life and the potential of redemption from one’s sins. The more I look at it, the more things I see. It is called The Return of the Prodigal Son and was painted by Rembrandt some time right before his death in the mid-17th century. The Parable of the Prodigal Son is a common enough story that I think many people know it (and ought to, if they are thinking deeply about the tragedy of Anakin the Fearful). A father has two sons. The younger takes his inheritance while the father is yet alive, and blows it all on loose living. Finding himself in a sad state, he goes back to his father in full repentance. His Father embraces him and holds a feast in his honor for his return. The older brother, who never left home, becomes very jealous, finding no joy in his brother’s return. The father tells him that all should celebrate the return of a fallen brother. Our eyes then drift over to the right side of the scene. The older brother who is jealous that forgiveness is so easy. He also does not think about the thing in his own heart that he may need to excise. After all, he has his rights! Here is the celebrated question – how is it that the son who lived a God-pleasing life in all respects, and who faithfully served his father, could display such envy? This is because the older son had everything given to him in order to love the father, but made an idol of his blessings. We drift further back into the painting and see the attendants of the household ready to obey the commands of the father. What should they do? Put the boy in prison or prepare a feast? Feast, of course! The son was sprung from the prison of his own making. But keep looking. More witnesses appear from the background. A man emerges from the shadows and then a woman a few steps above all. They are the witnesses to the greatest miracle ever to come from a human – utter penitence for profligate living that is met by absolute forgiveness from the father. So, on our circuitous route (which is either a function of my brain or the Orthodox way of teaching), I hope you have seen that Anakin’s place with the blue shiny people is not mere sentimentality. It is the embodiment of a true change of the soul and self sacrificial love. Redemption is not about the magic formula of saying the right things before expiration, but the true turning of the depths of the soul to what is good. With Anakin losing the mask of hatred and destruction, the scars of his battle filled life are still present on his face. However, his heart had truly turned from that evil. The unending love of his son was enough to win him back. Very good read and insight into the mythology of Anakin Skywalker. I have always thought that Anakin also believed that he was doing good. He had visions of what was best for the universe regardless of how evil and warped those visions of righteousness had become. That’s the deal with all sin and depravity. There is something in them that is thought to be good or pleasurable, but ends up being the enslaving power. I don’t think that good is relative in general, though as a human being, I certainly try to rationalize the dumb decisions I make. Anakin believed he was doing the right thing for his wife and child, though it was ultimately the manifestation of the weaknesses in his person. And as for visions, they need to be tested. They need to be measured against truth and reality. A vision needs to be tested by time and through the counsel of good people. Neither of these things has happened in the Anakin story. The end of Revenge of the Sith seems very truncated in time, and he only had the lead demon for a confessor. In short, he was wrong, reveled in the wrongness, but was brought back through time and goodness. I think. Well I will try to analyze Anakin, why He is the Chosen One. Note that I am not going to employ any Orthodox or Christian thought into this; this is mostly based on the Star Wars universe and how Anakin being the Chosen One fulfilled it. During the time of Anakin, the Jedi Order was already corrupted by the corruption which has overtaken the Old Republic. This was not anymore the same Order that was upholding the good, although in some ways it still was. By upholding though the Old Republic the Jedi Order has invariably put itself into protecting the very corruption the Order was made to fight. Probably as well some of the Jedi have compromised themselves into this very same corruption. Thus it became necessary to purge the Order, and Anakin was the one destined to fulfill that. The Order was then purged, with most of the Jedi either killed or went into hiding. With the Order purged then, was balance restored? Well, we all know it wasn’t: the Sith came back to power (anyone who knows SW lore would know that the Sith had earlier also came into power in the past). So there is still need to take out the Sith in order to bring balance back into the Force. With some help from his son, Luke, Anakin as Darth Vader then put an end to the Emperor, though at the same time sacrificing himself in order to do so. With the Emperor dead, the Jedi Order purged, and a New Jedi Order would be started by Luke (well, hopefully we get to see the new Jedi Order in Episode 7 onwards…), balance was finally restored. So, to make it all short, Anakin’s fall was a necessity in order to cleanse, as it is, the Jedi. And Anakin’s redemption was a necessity as well in order to rebalance the whole of the Force (and one can see then why Episode 7 onwards isn’t necessary, but that’s another story…). As said in the movie: the circle was then complete. Thanks Rodney! Isn’t this a lot of fun? I love it! I absolutely agree with your analysis of the Jedi Order. Frank Oz recently revealed that Yoda speaks that way because that is how Jedi of generations past spoke. Something has obviously changed, since the language of the Jedi now is the same language as the common person. They have lost their ideals and traded them for bureaucracy and political legitimization. The question of balance is interesting. I have always, since Heir to the Empire days, wondered what balance truly looked like. 50/50, evil/goodness? That is an actual balance. Is it balance that there are 10,000 Jedi and 2 Sith? And yet it seems the galaxy is moving towards a different definition of balance. Light keeping the dark in check. I am not sure if what happens on Death Star II was foreordained, in universe. I am inclined to think not. At every step, it is the freely chosen actions of every person that drives the story. The prophecy can still stand, but only in the form of prescience, and not compulsion. It is my hope that the Whills make an appearance in the new canon. That explains so much of the oversight and guidance from the Light side. They are actually neutral, to some extent, but provide the rule by which balance will be measured. If it matches up with the guidance of the preternatural protectors, then it will find bounty. I think what happened in Death Star II was preordained (in universe, of course): that was part of Anakin being the Chosen One. It was necessary for it to happen in order for him to fulfill his role and rebalance the Force. I am not sure about how balance works, but all I know is the Rule of 2 for the Sith doesn’t seem right. I hope they would either clarify that or do away with it all together in Disney’s canon. I would rather adhere to how the SWTOR cinematic, “Hope” and “Deceived” showed the Sith: there were many of them and were more than ready to take on the Jedi with their number. No worries about bringing any of the particular religious traditions. As I have always said here on Coffee With Kenobi, that is my point of view and tradition, and I can’t speak to anyone else’s tradition without a bit of disingenuineness. Play with the concepts in any way you see fit. That’s the fun of all of this. To my thinking, there is a problem with predestination in the SW universe. Look at when Mace was interviewing Anakin for the first time: he recognized the potential for Anakin to be the Chosen One, yet would have denied him the ability to training. So, of course, it did go through, meaning that the predestination could have still worked. I believe that the Force tends toward the benevolent. Perhaps neutral is the lack of destruction, chaos and despair. So for me, neutral has an air of goodness to it. That said, always in motion the future is. 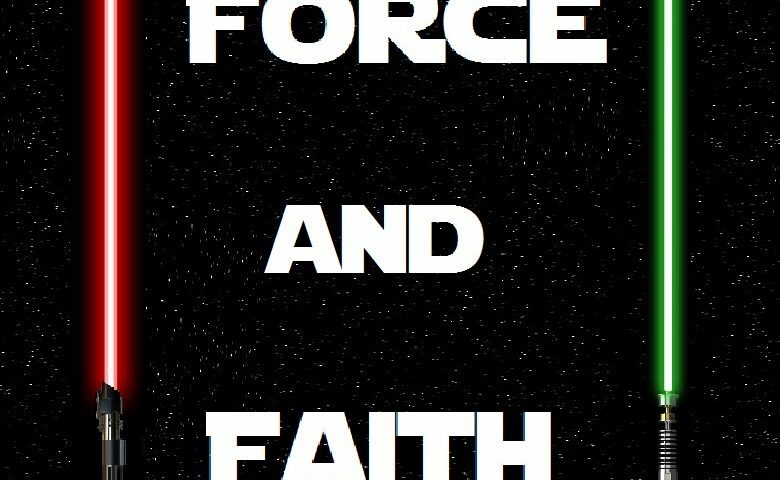 The Force is the binding created by life. The destruction of life would be to seize power over the Force, rather than work with it to bring about life and growth. Anakin chose, though he could have made other choices and ended conflict earlier. Now I want to go back and rewatch the Mortis arc in Clone Wars to see what they have said about predestination. That all is good in universe, however I think predestination is absolute bunk in reality. I could talk about the Prodigal Son for hours. I always envision myself as the older, resentful, rule-follower son, and I disagree with what the “celebrated” question is. My mind always goes to, “Why does the one who follows the rules get the shaft?” And then I feel badly and think, “Pam, you idiot! THAT is your problem,” and his. This is one of those stories that makes me realize that I’d *like* to feel the right way, but I just…don’t. I want to be the younger son, the one who screws up but is loved unconditionally anyway. To me, that’s what’s Anakin’s redemption is all about. No time…more soon. Great entry. I get that. I was the nerdy older brother, with two semi-delinquents following behind me. Their words, not mine! Both of the sons of the parable represent deficient human beings. Our natural state is to be with the father, joined in full unity of purpose and in love. But one is prodigal, the other is jealous. I felt the same things. When my brothers would be sick, I was jealous of the attention they gave. I should have just brought him some medicine and assisted my mother. With another 4,000 words, I would have explored the background witnesses – perhaps playing the parts of Jar Jar, the droids or Shmi. That is indeed Anakin’s story, but we need not follow his example. But in another way we are the prodigal son – returning home after having turned away at some point in our lives, whether on a large or small scale. There is something in me that resonates with redemption stories. I love Star Wars as well and when the first “The Force Unleashed” came out, I bought it in all forms (i.e., game, comics, book) because I LOVED the story so much. It seems that this age loves the anti-hero, but there is just something that stirs the heart when one who is evil truly turns. I never got to the Force Unleashed stuff, and I haven’t gone back to the EU so much in the past couple of years. You are right about the anti-hero. In our time, all sacred cows and holy objects are being pulled down. There is no surety under our feet, and we have no social code that we can cling to. Therefore, the rebels and self-made people of questionable character has become the archetype. Not so in Star Wars, of course, as the story takes special care to bring Han to a righteous position. Anakin’s return is special and complete because it also turns away from utter evil to utter (and definable) goodness. Thanks for reading! Check out some of the other bloggers here on CWK – I am truly a Sullustan among Wookiees here. I will say that this was a powerful blog, and one about which I intend to spend a great deal of time pondering. Maybe it is a good thing that I don’t have the necessary time to leave a long comment. My gut reaction probably would be quite different from that of a long, well-though out commentary. Since seeing ROTJ (my favorite Star Wars film), I have gone back and forth about how I feel about Darth Vader’s/Anakin’s redemption. Some days, I am accepting of Anakin’s true self (as I like to say) reawakening, and the fact that Anakin was redeemed by his act of saving Luke. Other days, I’m not so sure. While sacrificing his life to save Luke goes a long way toward redemption, is it enough? Sometimes I’m not so sure. Thanks for stopping by! I look forward to your thoughts! As for the amount of action needed to achieve salvation the answer is quite simple. We can never do enough. We can never quantitatively satisfy the needs of salvation. And that makes perfect sense, since it is about being brought to a higher state, or a transfigured life. If we are being brought up to something, then a higher power (and I have definite thoughts on who that is!) must do the work. There is nothing we can do to merit salvation, warrant forgiveness or be deserving of any gift. That is why it is grace – something that is freely given, regardless of the damage we have done to our personhood. Now, what we are talking about is the acceptance of such a gift. Could Anakin save himself? No, that wording doesn’t work. “Tell your sister you were right…” Salvation, from the human point of view, is a function of freewill. I tell my congregation that freewill is perhaps the greatest gift given to people. Because of the ability to choose, we can receive great blessings. But, in order to choose, our decision to choose otherwise will also be respected. I think it makes sense that Anakin chose to give up the evil, which from a certain point of view, is nothingness, and allow the good and light to work through him. Have you read “Lords of the Sith”? (If you have not, and would like to, I caution you about reading the rest of this paragraph. If you’d rather not have even an inference of the novel’s ending, please skip to the next paragraph.) I stayed up to the wee hours of the night last night to finish it (I will pay the price later today lol), and the ending — like so many of Darth Vader’s atrocities — are indicative of why I have a hard time accepting that Anakin was redeemed by one, lone act. As Darth Vader, he has no conscience. He is driven by the evil in his withered, cold-hearted heart. Innocents pay the price. Can ONE unselfish act be ALL that is needed for complete redemption? As I have stated many times before, I think saving Luke was a step in the right direction toward Anakin’s redemption. Luke forgiving him helped Anakin take a giant leap in that direction. But total redemption? I still grapple with whether I can buy that. Some — including you, perhaps — may say that Anakin gave the ultimate sacrifice — his life — that he did so unselfishly, and that was enough for his true self to reemerge and return to the Light Side. I argue, however, that redemption is tightly tied to atonement. While Anakin may have atoned enough for the wrongs he inflicted on Luke — in Luke’s eyes, by the way — he (Anakin) certainly did not atone enough for the wrongs he inflicted on others. He didn’t live long enough to ask everyone else (or the families of those who had died as a result of Vader’s evil) how he could make up for his past wrongs. Please don’t get me wrong, James. As far as Star Wars goes, I always have a smile on my face as the final minutes of “Return of the Jedi” tick away. I eagerly await the moment Anakin comes to his senses after what has been a very, very long sleep (or absence from his true self, from the Light Side) to save Luke from the greatest evil of all (Emperor Palpatine). My heart wrenches as I watch Luke reunited with his father, only to have his father torn away from him in the blink of an eye. My heart aches as I watch Luke in solitary silence at Anakin’s funeral pyre. My heart rejoices when I see Anakin appear at Yoda’s side, visible only to Luke (I still say Sebastian Shaw’s head should not have been replaced with that of Hayden Christensen’s, but that’s a blog for another day 😉 ). There is hope for the future, and that is a great way for a film to end. Don’t we all prefer to be left with a sense of hope? Ultimately, if Darth Vader/Anakin can be redeemed, there is hope for the rest of us, n’est-ce pas? That is what my heart tells me. 🙂 It’s listening to the thoughts in my brain that bring me to the conclusion that Vader’s one act — unselfish though it may be — was not enough for total redemption. You point out in your response to my initial comment that redemption relies on atonement, grace that is freely given AND acceptance of that gift of grace. In the end, the last part of the equation is likely where I have issues regarding Anakin’s ultimate redemption. Even if his one unselfish act was enough to lead him to redemption, and that Luke freely and willingly forgave him, HOW IN THE WORLD could Anakin BELIEVE that one act was ENOUGH to bridge that final chasm to bring him to redemption??? If Anakin came back to the Light Side when he chose to save Luke, once reawakened, would he not be horrified by all the atrocities he had inflicted on the denizen of the galaxy, thus believing that single act could in no way, shape or form result in his ultimate redemption? I will again simply go by the Star Wars universe, and not mix in any Orthodox or Christian points here. Anyway, if we go by ROTJ, then yhes Anakin was fully redeemed when we see him together with Yoda and Obi-Wan (and as an aside, yes I’d rather have Sebastian Shaw in that scene there than Hayden, and not because I don’t like Hayden [IMO he did a passable job as Anakin in Episodes 2-3. I said passable, not Oscar-award winning performance], but because Luke wouldn’t have any memory of Anakin when he was young but would more likely recognize Anakin the way he saw him at the Death Star). James, just so you know, I was not trying to impose any Orthodox or Christian tenets pertaining to atonement and redemption on Star Wars nor on Anakin. I was musing based on whether it was logical for Anakin to be redeemed after one unselfish act. For those of us who have been fans of the EU, it took Leia much longer to forgive her father than it did her twin, and she suffered just as much at Vader’s hands as Luke did. I tell my congregation that one of the greatest gifts given to the human person is free-will. Because of free-will we can choose the good or the bad – and the choice is respected. That respect of choices ensures that no choice is ever done out of compulsion. It is almost as if we are all different people with personal opinions and ways of coping, as with Luke and Leia as you said. GL wrote a certain aspect of his own spirituality into the stories, but let enough universal truths inhabit the story that almost any group can come to the story and try to make some sense of it.